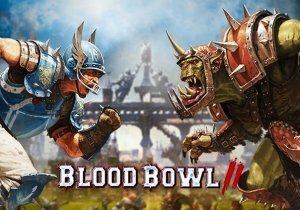 Throw Warhammer and American football into a blender, and what comes forth is Blood Bowl 2. Now Blood Bowl 2 is no ordinary game. It’s not just American football combined with the living world of Warhammer, it is much more than that. All it is missing is the secret ingredient of salt. Thankfully that is where you come into the mix, because this game will make you salty, in one way or another. Combined with some humor, and you’ve got yourself a special breed of turn based game. I have never hated myself more playing a videogame when I was playing Blood Bowl 2, and this isn’t necessarily a bad thing because the game itself is a lot of fun. But let’s talk about the game first before I start with the salt. Blood Bowl 2 is almost the exact same as American Football, except that there is a little bit of violence involved, and lady luck can be against you. First off there is campaign mode. In the campaign you will take over a human team called the Reavers, replacing their last manager. The Reavers haven’t had a successful run. They have been losing season after season and are on the verge of being bankrupt. It’s an interesting premise for a tutorial, though seems it could have been much more as a final challenge in the campaign. Still I can forgive this missed opportunity in a heartbeat thanks to the amazing commentators. They break down the bizarre game rules, and risks involved, before you’re left to your own devices rebuilding the shambles of a team. It didn't take long to realize I was not the chosen to save this team. In Blood Bowl 2 you can play as a variety of racially based teams. Though the campaign is limited to the humans. While the visuals are nice, most teams are essentially the same group. You have the Lineman, the Catchers, Throwers, Blitzers and the Ogre. Each team has their own variation of these units and or a mixture of two types for some slight variety. The Linemen are just the normal players; they can play in any role but don’t excel at anything. The Catchers are great at getting into position and catching long passes, the Throwers excel in passing, and Blitzers are great at offensive pushes. The Ogres well… they just smash anything in arm’s reach. Use that how you see fit. Teams are limited by player salaries, and you’re limited to the number of players on the field at any time. No team composition is the best in all situations, and sometimes having a few extra players to react to your opponent’s build can pay off. Just be careful not to hire too many superstars or you won’t have the funds to fill the minimum roster. The campaign is a great start to get to know the game and figure out the controls, but once you’re ready you can join a league with one of your teams. You can always create a new team with a different race, but once you have joined a league you obviously do not want to switch around teams every time you start playing. You can choose to go for a solo league where you play with your team against the computer, or join an online league where you play against other players. I decided to go in right away and play against other people, I imagined I wouldn’t be that awful at the game right? My losing streak only continued in online play. Well I was wrong! I was the worst player this game has ever seen. I lost game after game without even scoring a touchdown. And since games take a long time, and can literally take up to a few hours, I spend my whole day being a very salty man, trying to get better at a game that I enjoyed, but hated at the same time. Losing obviously isn’t fun, but I’ve always been a very competitive person, and I simply cannot stop a game when I haven’t even won a single game. I know how American Football works, have played a ton of other football games, yet Blood Bowl 2 was an entirely different beast. The game has the same rules as American Football. At kickoff you get to position your team in preparation to receive or kick the ball. After the ball is kicked, the battle errrrr, game starts and you will have to work your way forward just like any other football game. But you will have to take down other players while doing so. When your players are clustered up they get more bonuses for picking a fight with the enemy players, so you want to make sure you have all the advantages you can get before taking a step forward. You cannot simply run away from an enemy unit, because most of the time you end up tripping or being kicked from behind when trying to make a run for it. Every time a unit comes close to an enemy, there is a chance something happens, and since your units are also able to be a little bit clumsy, lady luck can either be on your side or be a pest. Learning the tricks of the trade is rough when this game has so very many tricks! While picking a fight with the enemy, you have to tactically move the rest of your units in the way of defending or stopping the football carrier. But since the opponent is trying to do the same it is a fun game of kicking each other down back and forth until there is an opening. As simple as this sound, and as fun this can be, at the same time it is also very infuriating. Think of playing real-time chess with the skin of football, and realizing your opponents have been studying chess maneuvers all their lives. Playing this game felt like torture, but instead of hating it I liked it, like some sort of football masochist. The drive to win was all I needed to keep playing, hour after hour. The humor well… I suppose that kept me sane in the process. Have I won a game yet? The answer sadly is no. After hours and hours of playing I haven’t managed to win against another thinking human yet. The game is very competitive and each team is different than the one you faced before. Each race also has their strengths and weaknesses, and playing against some races is simply not fun because your players get smacked around like a piñata, sometimes literally exploding. But instead of candy coming out of you, your player is just gone, leaving a glaring hole in your defensive formation. I never knew such a torturous game could be so fun, but I do wonder about my sanity. Zenimax Studios has revealed details for the next DLC for The Elder Scrolls Online: Horns of the Reach.